Christmas comes early to Chandlers Ford! John and I are so excited about Christmas that we couldn't wait any longer to start celebrating and have turned our window into a Santa's Grotto packed with tempting ideas for gifts! They range from stocking filler interconnects and Pioneer and B&W headphones to Ruark digital radios, compact Boston A25 speakers, highly desirable Naim separates and the perfect vinyl spinners from Rega, ideal for the annual outing of those tasteful Christmas albums in everybodys record collection! Our spinning Snowman changes colour and has been known to turn green so we may have to cut back on the Cliff Richard festive tunes!! Why not pop in and see us. Beat the rush and celebrate Christmas now! There are bargains to be had, some of which may not be around if you leave it too close to December 25th. For example, we only have one Optoma HD87 ex demo projector. Fitted with a long throw lens and only 151 lamp hours on the clock this is a fantastic Full HD DLP projector which retails for £2799.99 at an incredible festive price of £1999.99, saving a massive £800! 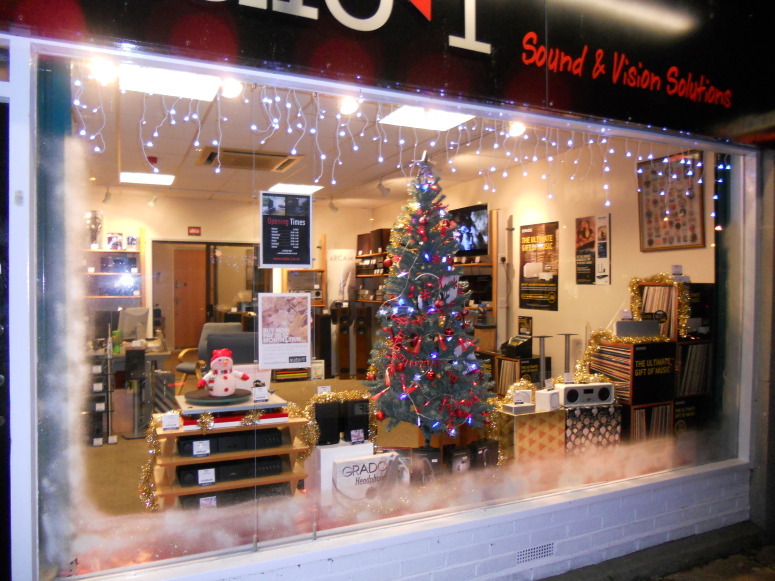 Also featuring in our Winter Wonderland window is the Superb Sonos promotion. Just purchase a Sonos Play 3 wireless zoneplayer for £259.00 and you will get the gift of a free Sonos Bridge and a Napster Music Account free for 6 months! That's £100 worth of savings for you treat yourself or one of your loved ones with! It's all you need to get a Sonos wireless music system working in one room of your home and to gain access to over 15 million songs! Fantastic! As if that isn't enough the offer extends until 31st December, if stocks last that long. Don't leave your Christmas shopping until the last minute. Come and see us now to get some present ideas ahead of the rush and avoid a last minute panic. You never know, you might pick up a pre Christmas sale bargain!